Welcome to Seeds of Strength’s grant application site. Our grantmaking process is the heart of what we do for our community. Thank you for your interest and for all that you do. With the 2019 grant cycle, Seeds of Strength will celebrate 10 years of women coming together through collective giving to benefit the Georgetown community. To date, Seeds of Strength has invested $1.1 million in 27 different nonprofits serving Georgetown residents. In 2018 we awarded 8 grants totaling $173,000. Seeds of Strength recognizes the valuable work of the many local nonprofit organizations that address the critical needs and social issues facing our community. To support this work, we annually award grants to nonprofits, providing them with funds to support projects and programs benefiting the residents of Georgetown. Each year Seeds of Strength pools its annual membership donations. In May, those dollars are awarded as community grants based on a democratic selection of grant recipients by the membership. 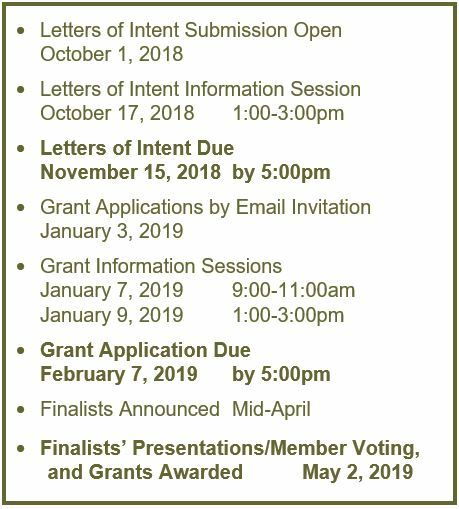 Our 2019 grant cycle will start accepting Letters of Intent (LOI) from nonprofit agencies on October 1, 2018. The list below shows downloadable versions of documents used in the application process. The actual grant application form is provided only to organizations invited by Seeds of Strength. Answers to many commonly asked questions can be found on the Grant FAQ Tab below. Make your reservation by clicking on the appropriate date above. Welcome to our 2019 Grant Cycle. 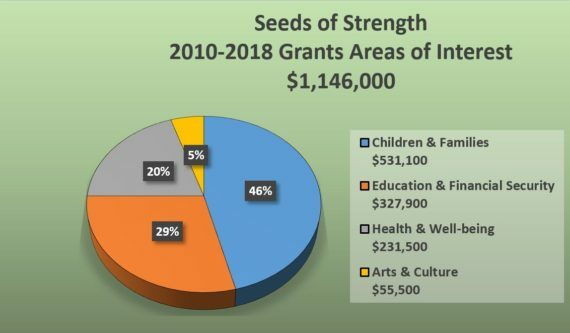 Seeds of Strength solicits grant proposals in the fall, evaluates the proposals January through April, and awards Grants in May. We do not accept grant requests past our submission deadlines. Click the link to read ABOUT OUR GRANT. We recommend that you carefully read through the 2019 Grant Guidelines, ELIGIBILITY REQUIREMENTS, GRANT FAQ, and look at the 2019 Grant Schedule before proceeding. 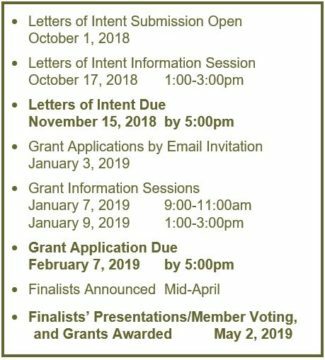 Please review the following ELIGIBILITY REQUIREMENTS to be sure that both your organization and your proposal meet the criteria for a grant from Seeds of Strength. Consult the AREAS OF INTEREST and GRANT FAQ for more guidance. Seeds of Strength has a four-step GRANT APPLICATION PROCESS. Click the link to read about the GRANT FREQUENTLY ASKED QUESTIONS.